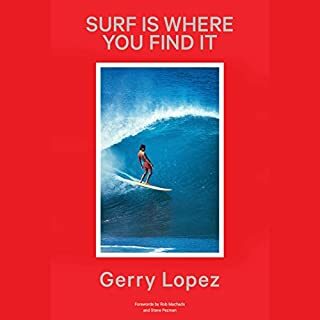 Written by one of the most revered surfers of his generation, Gerry Lopez's Surf Is Where You Find It is a collection of stories about a lifetime of surfing. But more than that, it is a collection of stories about the lessons learned from surfing. It presents 38 stories about those who have been influential in the sport - surfing anytime, anywhere, and in any way. Slow start but a great book, worth the read! Must read to understand 1996 Everest disaster. In 1967, 12 young men attempted to climb Alaska's MountMcKinley - known to the locals as Denali - one of the most popular and deadly mountaineering destinations in the world. Only five survived. Journalist Andy Hall, son of the park superintendent at the time, investigates the tragedy. He spent years tracking down survivors, lost documents, and recordings of radio communications. In Denali's Howl, Hall reveals the full story. In early May 2006, a young British climber named David Sharp lay dying near the top of Mount Everest while forty other climbers walked past him on their way to the summit. A week later, Lincoln Hall, a seasoned Australian climber, was left for dead near the same spot. Hall's death was reported around the world, but the next day he was found alive after spending the night on the upper mountain with no food and no shelter. In 1996, Beck Weathers and a climbing team pushed toward the summit of Mount Everest. Then a storm exploded on the mountain, ripping the team to shreds, forcing brave men to scratch and crawl for their lives. In this powerful memoir, Weathers describes not only his escape from hypothermia and the murderous storm that killed eight climbers but the journey of his life. This is the story of a man's route to a dangerous sport and a fateful expedition, as well as the road of recovery he has traveled since. Mark Twight is a BANFF award-winner, an extreme climber, an extreme writer, and an extreme personality. No matter what he's doing, Mark Twight takes a definite, and often controversial , stand. 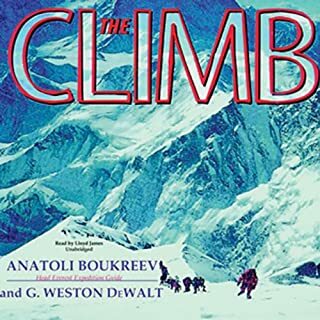 Anyone who knows climbing knows Twight's name, and anyone who knows Twight's name will want to listen to this audiobook. Each story is told in Twight's taut, in-your-face style. Brand-new epilogues bring each piece full circle, providing updated information and fresh, hindsight perspectives. At 28,251 feet, K2 might be almost 800 feet shorter than Everest, but it’s a far harder climb. It will kill you on the way up and the way down. Mick Conefrey guides us through the early story of the legendary mountain and the extraordinary attempts that led up to its first ascent in 1954 - these are tales of riveting drama and unimaginable tragedy. On the morning of 2 June 1953, the day of Queen Elizabeth's coronation, the first news ebbed through to the British public of a magnificent achievement: Everest had finally been conquered. Drawing on first-hand interviews and unprecedented access to archives, this is a groundbreaking new account of that extraordinary first ascent. In a thrilling tale of adventure and courage, Mick Conefrey reveals that what has gone down in history as a supremely well-planned attempt was actually beset by crisis and controversy, both on and off the mountain. This gripping and triumphant memoir follows a living legend of extreme mountaineering as he makes his assault on history, one 8,000-meter summit at a time. A preternaturally cautious climber who once turned back 300 feet from the top of Everest but who would not shrink from a peak (Annapurna) known to claim the life of one climber for every two who reached its summit, Viesturs lives by an unyielding motto: "Reaching the summit is optional. Getting down is mandatory." It is with this philosophy that he vividly describes fatal errors in judgment made by his fellow climbers, as well as a few of his own close calls and gallant rescues. And, for the first time, he details his own pivotal and heroic role in the 1996 Everest disaster made famous in Jon Krakauer's Into Thin Air. No Shortcuts to the Top is more than the first full account of one of the staggering accomplishments of our time; it is a portrait of a brave and devoted family man and the beliefs that shaped this most perilous and magnificent pursuit. I read allot of mountaineering books. Ed Viesturs story is one of my favorites. Not only has time proved him to be one of the world&#8217;s premier mountaineers, but the narrative this book shows that it is not by luck that he lives to tell the tale. Viesturs is proven to be a man of resolve, character, and discernment. I was apprehensive of reading this book because of many reviews that told of a boastful man who is full of himself. Nobody wants to read a 350 page work of hubris and self adulation. As I read this book and gained respect for the man, I realized that some have mistaken his realistic evaluation of situations as self congratulation. This is an error. Viesturs is an extra-ordinary (not ordinary) man. So when he recalls things that are just recollections of his reality, some may interpret this as a huge ego. However, it is his ability to make clear and unemotional judgments about situations that has gotten him not only up, but down the mountains he has climbed. This is unlike the self flagellation of some who profess humility, while clearly seething with pride at their own meekness. Viesturs makes no such claims. Buy this book, learn from Ed Viesturs, enjoy. Vicarious Immersion into this Rare World! This book, unabridged, is the primer and introduction for one who might want to lose oneself in this genre of books. High altitude mountaineering is grand drama, with killing cold, and with oxygen starvation that hobbles the brain and causes the body to consume itself. This is where storms appear out of nowhere, and simple injuries can become a death sentence, because help often is unavailable. Fiction is unnecessary because up here the true stories are incredible. Yes, Dr. Viesturs’ book uses the word “I” a lot: It’s an autobiography as well as an overview. Arguably the world’s best, the guy practices great safety discipline, and deals in facts. He also is a superb historian of the mountaineering culture, and he describes that community in a way that lets you decide whether or not to immerse further. I went for it. I listened to ALL the Viesturs books, plus several others. Exception: The superb *Himalyan Quest* book of full-page photographs. It puts things into perspective, and must be enjoyed in paper form. Look, we can’t all climb these mountains, but we can read, and watch movies and videos. This book is the primer. It fascinates while it gives you a taste. Then, if you choose to immerse as I did, you can enjoy scores of hours of wonderful entertainment, as you climb the world’s highest mountains in your armchair. Now, Ed has an amazing physical condition along with unique genes that allows him to climb without bottle oxygen. At the same time, he makes a series of good decisions that curtail several climbs when it didn't seem right. He lived to tell the tale and climb again next season. So why didn't I like the book? Ed tells his story in which he is the only person that can sense good climbing conditions when all around him, make bad decisions in continuing to climb. He talks about his instincts, a lot. Perhaps it was the manner in which it was written that makes Ed look like he has a big ego. Perhaps better editing would have have softened some of these disagreeable moments. I would like to think that Ed is more humble in person then this books suggest. I would just liked something more definitive then instincts as a reason to perform an action. In the end, better editing would have forced him to be more precise as to his motives and reasons to act as he did on the mountains. Still, Ed is around to write his story when so many died along the way. I have read many climbing books, including nearly everything in print written about Everest '96. Although the tragic Everest season of '96 is just a portion of this book about Viesturs' 'Endeavor 8000' (or whatever goofy name he gave it), the book seems to be less a narrative of the climbs and more of self-praise book about the man. I found it especially odd how Viesturs continually inserts direct quotes and snippets from other climbers that gush praise over his climbing prowess. A lot of "Here's what so-and-so had to say about my superior guiding skills and incredible preparation... yadda, yadda". I especially had to laugh when Viesturs comments about leaving his pregnant wife for one of his Himalayan adventures, promising to check on her frequently by sat-phone. As his focus shifts to climbing, and he indicates his wife's displeasure over lack of communication via sat-phone, he writes it off saying, "Some people might have found (her) to be unreasonable, but I knew I had to focus on the mountain...". He's generous in offering critique and criticism of others - from climbers to sponsors to family & friends, to the point of being obnoxious. Anyone who dares to question his decision-making or his tactics, he immediately trashes. I found it very hard to listen to at points. I also found the narration to add to the tone of condescension - I don't think Stephen Hoye was the best choice for this one, as he seemed to add a note of whine to mix. My wife listened to this book with me for a while, but said she had to stop listening because she was bored with the author droning on about how great he is. I humored her and listened to the rest of it on my own. I have to admit that she's right. Mr. Visteurs does think more highly of himself than the average person and I too became disenchanted when he cites passage after passage of all the great things that other people wrote about him. I did enjoy the climbing stories, however, and he did accomplish something I would only dream of, so I guess he's entitled to a certain amount of self-congratulations. Overall, there are better mountain-climbing books out there and I would recommend skipping this one. Only 5 minutes into this book I was convinced that Ed. V is the most arrogant author I've ever encountered. I continued with this book only because I was curious whether his comments could get any worse. The good news is they do not. The bad news is they also don't get any better, or more humble. Frankly, I'm surprised this man has summitted anything - his ego is so big it must be difficult to drag along. I give this audio 1 star because I don't have the option to give it 0 stars. 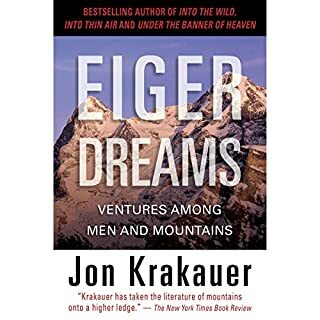 If you want a good read, good write, and compelling narration of an Everest expedition, get Krakauer's "Into Thin Air." "No Shortcuts..." doesn't come close to any of these. The reader is a bore, perhaps it is the content. Speaking of which, someone should do a count of the number of times the author uses "I". This audio is not about Everest or any other mountain, it is about the author, how great he is, how smart his children are, and his business ventures. Who cares? If Lunesta or Nyquil doesn't work for you, try this audio. Otherwise, skip it. Ed Viesturs has always been my Idol. The reader is good but his pronunciation of the mountains and French climbers’ names bothers me. Looking up how proper names of people and mountains should be mandatory. 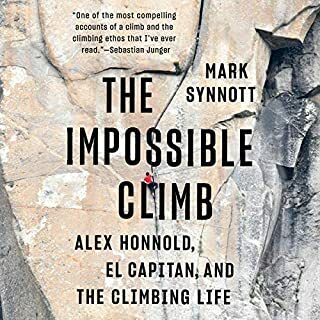 great narration...as a climber myself I found it to be motivating and inspirational having similar aspirations... great listen for sure, I'll be listening to it again soon. Breathtaking achievement. If like me you are obsessed about anything to do with mountain climbing you will love this. If you're not a 'mountain nerd' you will probably find this too long and too dry. Alot about this book is repetative, after all its a collection of stories about climbing 8000 m climbs, in essence its the same story over and over. Not for everyone but i loved it. was that the narrators tone and phrasing took a little while to get used to but stick with it as you adjust after the first chapters. Great book, especially for a keen climber that want to do more mountain climbing. Well narrated. An amazing listen about an incredible journey, with many lessons to learn from! A inspirational ethos throughout! a great journey through a fantastic career. just the right amount of detail covered in each of the major events without one particular thing dominating the whole book. that in itself can't have been easy given Eds involvement in the 96 disaster and his relationship with some of those who died. downloading more Ed Viesturs books now. Really interesting and action filled. Narrators voice was annoying but once I got used to it, I was able to focus on the story. Very well narrated, the guy has a voice smooth as silk. the story is amazing and really puts you in the moment. 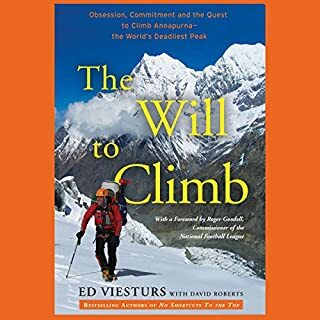 Very informative of every aspect of climbing and mountaineering, Ed Viesturs has a great story to tell. Highly recommended. Fantastic and inspirational audiobook. Thoroughly recommended reading regardless of whether you have or ever intend to go mountaineering. The preview hooked me and the book didn't disappoint! Mountain adventure from start to finish. Well done Ed. This book had me hooked from the first page! What a story and want an achievement. I've been reading mountaineering books for a couple years and this was right up there the best I've read. 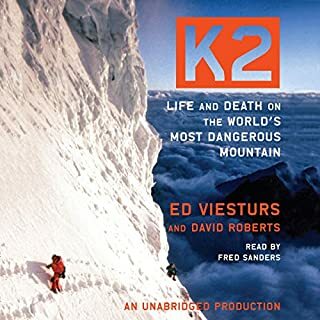 I love Eds point of view and insights into his own climbs and that of others and also loved that it wasn't just about one mountain but a variety of the 8000m peaks. Some good history on first ascents, etc as well. I spent a couple hours trying to find a book I wanted and am definitely glad I picked this one. I will definitely be reading/listening to some of his other books! 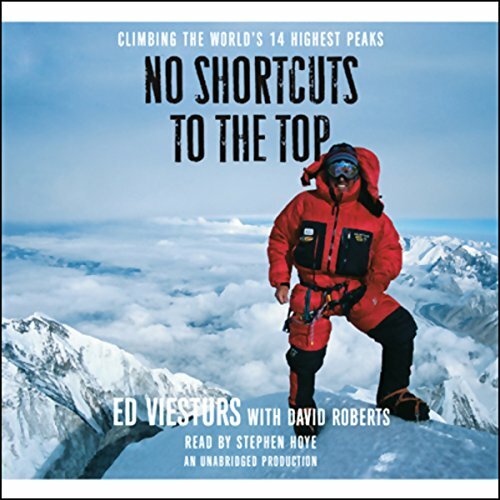 Would you consider the audio edition of No Shortcuts to the Top to be better than the print version? Annapoura summit he finally get to the top YAYYY! Entertaining, inspiring and a raw account of an amazing achievement. Everyone should listen to this. Ed proves that you don't need to be reckless to be incredible. story of exceptional mountaineering. both on the mountains and big picture. quite polished writing however. A great book for climbers or anyone wanting some inspiration. A great book about a really amazing sounding guy. Unfortunately this book does not live up to its potential. Some heavy editing and rewriting was required before publication. Far too much time is spent discussing sponsorship, love life, and generally fluffing around between climbs with virtually no climbing descriptions and anecdotes except pretty much in passing. Just when you think you are in for some climbing stories he moves on to post climb waffle. I have no interest in him buying a house, getting more sponsors or hooking up with some looker. It seems to me he doesn't even enjoy climbing. There is no reason to suspect he does other than that he keeps doing it. I suppose if you enjoy learning what a climbers general life is like you will enjoy the book. If you are interested in sharing in the thrill that climbing must be, you will be disappointed I suggest. The readers performance is adequate though uninspired. I can't blame him given the material he had to read.